Extra! Extra! The Seen + Heard Fife newspaper is here! 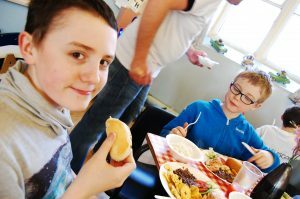 In our Seen + Heard Fife programme we work with looked after children, with different care experiences – foster care, kinship care or looked after at home. A common thread running through many of these children’s lives is that they are living with memories and experiences of trauma, separation and uncertainty. This is at odds with feeling safe, secure and curious about the world. Children need safety and security to explore and grow; at a basic level, children who are on constant alert, have anxiety, second guess their safety and don’t understand their emotions do not have the capacity for play, learning and curiosity. This results in children being unable to take in any information that is not related to immediate survival – and when it comes to whether the brain can learn about maths or needs to remain at full alert to protect itself, then biology promises that the brain is going to choose survival. All of life is experienced in the context of our relationships – neural connections and meaning must come through other people, we simply cannot do this alone. This means that our children are relying on us, the adults in their lives, to provide those relational opportunities to learn about other people, the world and themselves. Dr. Bruce Perry has stated that we, as a society, are “materially rich but relationally impoverished.” Children simply aren’t getting the quality and quantity of relationships that are needed to build up a robust, resilient and healthy brain. He warns that without these building blocks children cannot engage in essential social skills, including empathy. At Children’s Parliament we believe that #itsallaboutrelationships. We know that the gift of empathy is something we cannot afford to withhold from our children. We need to do everything we can to increase Scotland’s relational wealth, and we need to do this by providing opportunities for all children to have more and better interactions with adults and children. “No part of the brain can change easily without being activated,” says Perry, “you can’t teach someone French while they are asleep or teach a child to ride a bike by talking to them.” We believe that we need to invest our resources and time in children to create spaces where relationships can flourish and repair. One adult cannot do relational work easily with large numbers of children; we must do long-term work where ratios of available and interested adults to children are high, where connections are maintained for as long as possible. For our Seen + Heard Fife programme, we put this understanding of trauma, attachment and relational capacity building into action. We prioritise having multiple, supportive adults working with our small groups (up to 10 children with at least three adults), we invest time into relationship building rituals such as daily emotional check-ins and reflections; we emphasise processes over outputs; focusing on creative activities and discussions which build relational connections between adults and children; and encouraging peer-to-peer bonding, such as recognising personal qualities and achievements and practising empathy and social skills which activate relational healing. When we think about a safety net for our children perhaps this is what we need to be considering – a web or net of social connections and relational riches that allow our children to take risks, explore and stretch themselves, knowing that should they fumble they have a net of relationships which will support them. What can you do to increase the quantity and quality of interactions you have with children? What can we do together to build the relational wealth of Scotland? Papier mâché week is the main event of our Seen + Heard groups: an intense five-day experience of new skills, new possibilities and bringing children’s imagined ideal selves to life. It’s about more than making models: it’s about coming face-to-face with strengths and difficulties. On day one, the children are nervous. They have five days to turn newspaper and wire into a piece of art which represents themselves and their future dreams. It’s the new and ambitious nature of the project that makes the end result so powerful, inspiring pride and ownership of the work for children. They know they have to work hard, believe in themselves and their abilities, and make themselves vulnerable. While the whole week is a challenge we know the children are capable of doing this. As they complete the project, their old beliefs about not being good enough, or not being the kind of person who can create, are proven wrong again and again. It takes time and repetition to rewire the brain to support a positive and loving self-conception, so we make a point of challenging our children. We begin the day by giving each child a personalised compliments and challenges note. This always brings huge smiles. Eyes sparkle with the joy of being seen and of recognition. Later on, they’re encouraged to identify their own positive qualities: and with understanding and confidence, they often say they are “precise, empathetic, gentle, thoughtful and trustworthy”. The challenges are just as important as the compliments. We give each child a challenge unique to them. These encourage children to build on their existing strengths and allow us to help children focus on something new, which will help them feel happier and included. They accept their challenges with enthusiasm and often get straight to work. These compliments and challenges build up each child’s self-concept during the week, encouraging them to see themselves as full, rounded and known people. Compliments build the muscles to fuel the effort needed to grow, and mastery of challenges can be absorbed and grow into a conscious and valued aspect of a child, providing alternative ways of seeing themselves. Papier mâché is all about layering: adding structure through glue, water and imagination. 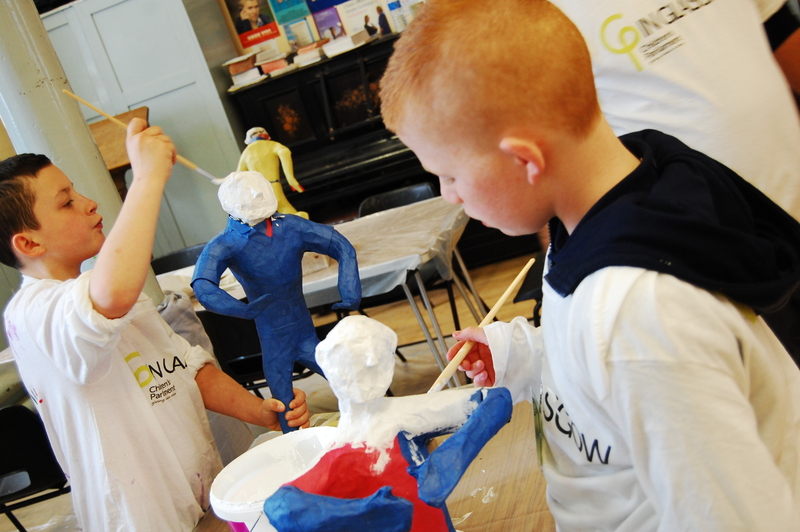 As they create their models, the children also remake themselves, adding layers of confidence and strength. These kids eat challenges for breakfast (along with bacon, eggs, and lots of toast). Seen + Heard Fife creates a space for looked after children to share their experiences, views and ideas about their lives. In order to share these key messages with more people, we have produced a newspaper. If you would like to order paper copies, visit the Newspaper Club website. Posted on June 30, 2017 July 5, 2017 Categories Seen + Heard UpdateTags Children's Parliament, NewsLeave a comment on Extra! Extra! The Seen + Heard Fife newspaper is here! The Seen + Heard Programme is a creative arts and rights–based programme designed specifically for looked after children, aged 9/10/11 years old. It focuses on understanding and balancing the individual needs of the children and encouraging their continued engagement and participation in a group of their peers, with emphasis on: working together as a team, building confidence and self-esteem, and enabling them to share their views, ideas, voices, challenges and successes. It aims to improve the well being of younger looked after children from across Fife; enabling them to explore their rights, have a say in matters that affect them, and speak directly to the Corporate Parent Board (CPB) and other adult decision makers. Children on the programme develop the skills, behaviours, values and knowledge they need to take part and be included in everyday life at home, at school and in the community. An important part of the programme is working in partnership with parents and carers, teachers, social workers and other adults and professionals who are involved in supporting the children. The first group was piloted in 2015/2016; the group was made up of ten children; three Care Experienced Young People (CEYP) – as Youth Ambassadors; two Children’s Parliament Project Workers and two Corporate Parent Development Officers. The project provided an innovative opportunity to test and develop an approach of engaging with younger children to obtain their views on the services they receive, which in return, fully informed future service improvement activity. The group discussed their experiences of being in care and of the support and services they’d received or would like to receive. They talked about the following themes of: Who We Are, Where We Live, Health & Happiness, Feeling Safe & Cared For, Freedom and Having Our Say. This first group has gone on to a ‘Transition’ group – where we continue to engage with the children with further consultations and activities, to maintain relationships and to continue to support them as they move into secondary school. In 2016/17, Fife Corporate Parent Board and Children’s Parliament were keen to provide the opportunity to more children and we were able to facilitate two groups. Over the last two years we worked with 27 children across placements types (foster, kinship, at home). Some children were new to care and others were in transition from foster back to parent; some had permanence orders in place and others did not. In 2017/18, we are running two more groups: “Seen + Heard 1 & 2”. We are looking to work with 20 new children this year, as well as continue our engagement with the groups of previous years: “Transition 1 & 2”. Children who are 9/10/11 years old and in P6 or P7 in the upcoming academic year. Increased confidence and self-esteem, reporting that they felt much more positive about themselves, their abilities and skills and their futures. Increased confidence in sharing their ideas and views with new people/adults. Increased confidence in working independently and in a team. More focused approach to tasks, even if they were difficult. Children were more able to concentrate and had more confidence to try new things and take risks. More aware of their feelings and emotions and how to effectively manage them. Were better at making and maintaining friendships, bonding and better at working cooperatively and co-operating with others. More willing to talk and share experiences about being in care and were more able to recognise and understand their potential role to contribute in relationships, their school and in the community. Developed better relationships with peers and adults and as a result reported feeling more secure, included and respected. Increased awareness of the Corporate Parent Board and its role in their lives.